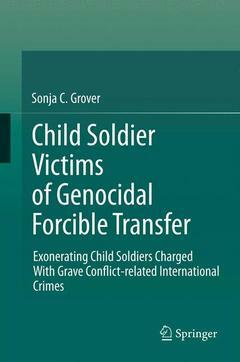 Child soldier victims of genocidal forcible transfer Grover Sonja C.
Auteur : Grover Sonja C.
This book provides an original legal analysis of child soldiers recruited into armed groups or forces committing mass atrocities and/or genocide as the victims of the genocidal forcible transfer of children. Legal argument is made regarding the lack of criminal culpability of such child soldier 'recruits' for conflict-related international crimes and the inapplicability of currently recommended judicial and non-judicial accountability mechanisms in such cases. The book challenges various anthropological accounts of child soldiers' alleged 'tactical agency' to resist committing atrocity as members of armed groups or forces committing mass atrocity and/or genocide. Also provided are original interpretations of relevant international law including an interpretation of the Rome Statute age -based exclusion from prosecution of persons who were under 18 at the time of perpetrating the crime as substantive law setting an international standard for the humane treatment of child soldiers. Children's Rights Participation Rhetoric: Distorting the Plight of the Child Soldier.- The Fallacious Demonization of Child Soldiers.- Recruitment and Use of "Child Soldiers" in Hostilities by Armed Groups Committing Mass Atrocities and/or Genocide as Itself a Form of Genocide.- Challenging the Attempt to De-legitimize the Human Rights Claims of Child Soldier Victims of Genocidal Forcible Transfer.- Truth and Reconciliation Mechanisms: A Re-victimization of Child Victims of Genocidal Forcible Transfer?.- Concluding Remarks.